I have been working away on a number of projects, but took some time out today to get the group and subscribo gifts for September ready. I am particularly pleased with the -Hanaya- Garden Wind Chime, and I hope you will be too. It looks great, but the best part of it is in the custom-created script that does two cool things. First, the chime tones are played randomly, with pauses, which makes for a very realistic sound output. Second, the volume is scripted to vary with Second Life wind. The windier it is, the higher volume you hear. Cool eh? Big thanks go to my brother-in-law Lance Corrimal for writing the script and sequencing the sound files. While I am on the topic of scripting, most of the scripts in my products have been produced by Lance. 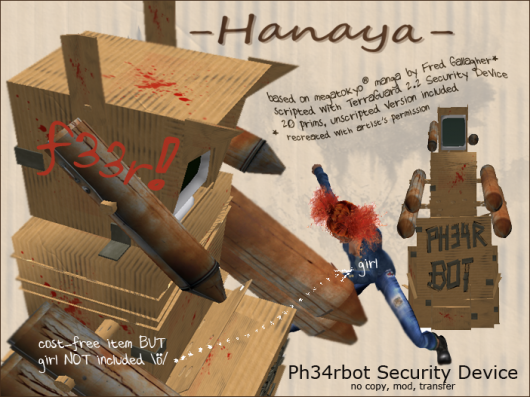 I am very grateful for his work on -Hanaya- products, since generally most of his efforts go to updating and supporting the Dolphin Viewer, my favourite Third Party Viewer. Can’t wait for the next release currently being developed, which will include Mesh. While on the topic of gifts, let me talk about hunt gifts for a minute. If you have been the recipient of one of my hunt gifts, you will know that I take special care to create something brand new for every new hunt, and that I ensure the item is top notch and in line with the quality of other products in my store. My policy has been, since my very first hunt, to place the item on sale after the hunt is over. So that means, if you take the time and trouble to come and hunt, you will get a brand new product for free during the hunt. And for the rest of the Second Life population who do not ‘do’ hunts, the product becomes available for purchase after the hunt is over. So, please watch the notices on our in-world group -Hanaya- Yummy Collectibles, and on our subscribo – the gifts are being sent out today. If you miss the deliveries, check the group notices or stop by the store and grab it off the Subscribo history. As always, the group gift is set out in the Customer Information area of our in-world store, where it will remain for the next 30 days. This entry was posted in Freebies and Gifts on August 31, 2011 by moriko. The -Hanaya- Autumn Bird Feeder is designed to complement this fall’s hues. Decorated with sculpted ivy vine, it includes a sitting and feeding sparrow and is mod/copy so you can place as many as many as you need in your garden. 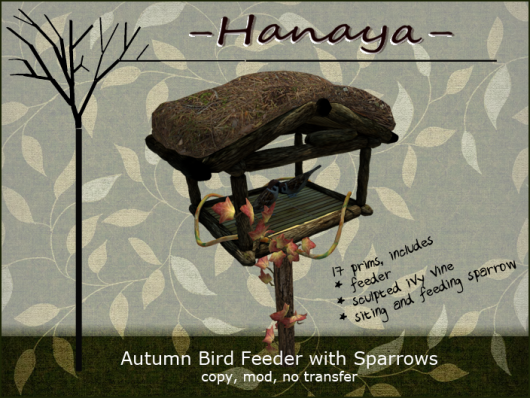 The feeder is rezzed and available for purchase at the -Hanaya in-world store, as well as our web store on the Second Life Marketplace. This entry was posted in Product Announcements on August 24, 2011 by moriko. The -Hanaya- ‘Up and Away’ Kitty Condo is a texture change cat hangout that includes 4 PG animations for cat owners and provides places for up to 12 full-size adult KittyCatS! * It comes in single colour mod/copy versions, as well as the deluxe colour/texture change edition pictured above – just one click for a whole new look. It is custom sculpted with loving detail and is only 10 prims in total. A space of 4.5 x 3.5 meters is recommended to allow you to rez the condo and to stand beside it while you groom your pet. The -Hanaya- ‘Up and Away’ Kitty Condos are now available at the Featured New Product area of our in-world store, directly beside the landing point. Come and try the demo today! Or shop from the comfort of your home at our web store on the Second Life Marketplace. KittyCatS! and the KittyCatS! Scratch-n-Play Post in the above image are NOT included, but are available for purchase at the KittyCatS! Main Store. This entry was posted in Product Announcements on August 19, 2011 by moriko. In my mind, August is a month for bold, strong colours – reds, yellows, oranges, deep vines and maroons. In my life, they are reflected in the produce from my garden, in the clothes that I yank out of the closet to wear, and in the perennials blooming in my garden. 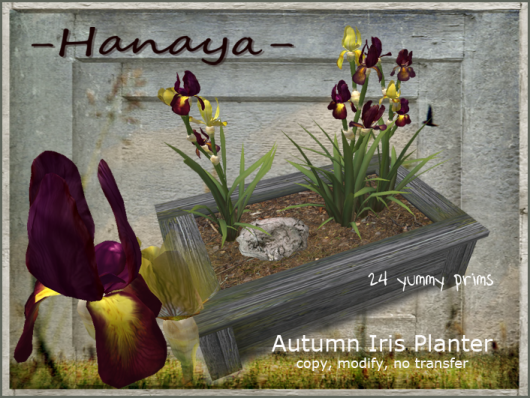 So it is no coincidence, that this weekend’s two new releases from -Hanaya- reflect those colours. If you are like me, in mid-August, you start to think about swapping out your summer decor for autumn. Our brand new Autumn Iris Planter is packed with tall bearded irises, set in a custom sculpted planter and is ready for you to set out on your terrace, by your front door or inside your store. Deliciously sculpted flowers in this fall’s spectrum of colours will delight you as you walk by, beckoning you to smell their fragrance. Irises look wonderful outdoors, but they are also one of my favourite cut flowers. It is no accident that my store, -Hanaya-, means flower shop in Japanese. Both my spouse and I are Japanophiles, and one of my key hobbies is flower arranging. Ikebana is the art of flower arranging Japanese style – if you would like general information, you could start at Wikipedia. Our brand new Iris Ikebana, aptly named ‘Scent of Autumn’, is a single bearded iris stalk with 4 open flowers, set in a mound of mossy earth. Subtly animated water ripples out from the plant toward a duo of wet, leaf-shaped rocks, which are topped with a single fallen leaf. 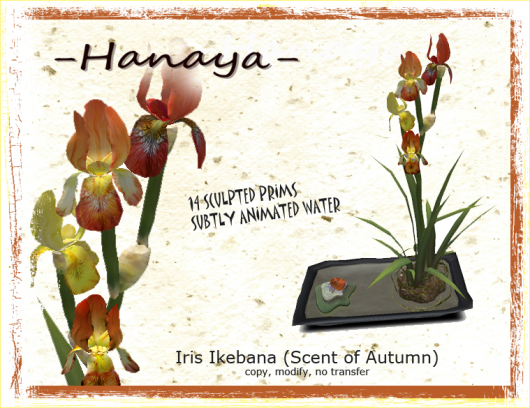 Both the -Hanaya- Autumn Iris Planter and the -Hanaya- Iris Ikebana (Scent of Autumn) are currently rezzed on display in the New Products area of our in-world store and are available for purchase. They are mod/copy for your convenience. As usual, they will also be available for sale in our web store on the Second Life Marketplace sometime next week. This entry was posted in Product Announcements on August 13, 2011 by moriko. If you are a Japanophile like some people around my house, you will have heard about Obon – the festival of lights. Obon is a Buddhist celebration during which many Japanese people honour the spirits of their ancestors. The end of the festival is celebrated by placing floating lanterns on water, and letting them drift with the current. The lights symbolize the souls of those no longer with us. 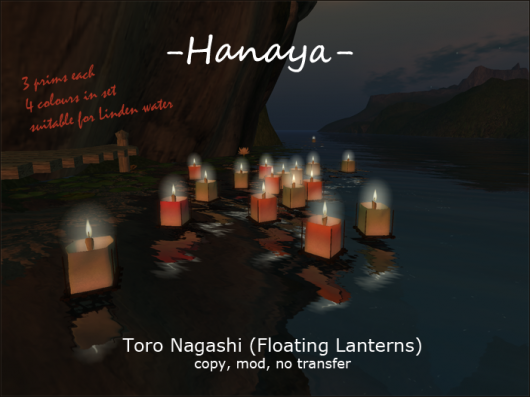 The -Hanaya- Toro Nagashi are only 3 prims each, come in 4 colours, and include a script to lower the lantern to Linden water and make it float gently reacting to Linden wind. An unscripted set of the lanterns is also included, should you wish to simply rez a lantern on dry land. 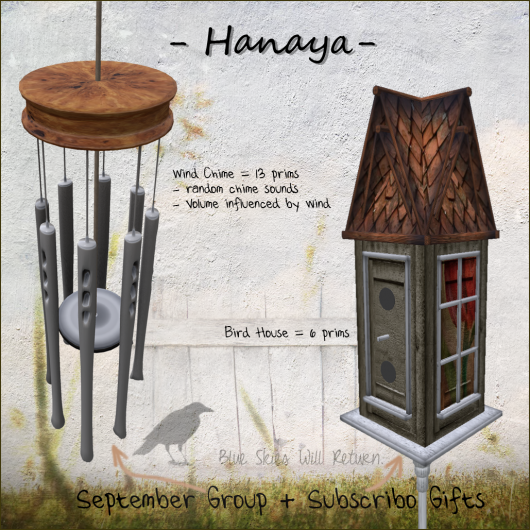 The lanterns are available for sale at the -Hanaya- main store in-world, as well as our web store on the Second Life Marketplace. Get yours now, and set them out next Saturday to take part in the celebration. This entry was posted in Product Announcements on August 6, 2011 by moriko. When I first heard about the Anime Hunt, I fist-pumped. That is because my better half has indoctrinated me to love all things anime and manga. Our real life house is kinda stuffed to the rafters with it. So I knew that I had to make something really cool, and I had to have permission from the artist to do a recreation. To make it even more fun, the Ph34rbot comes in two versions – one a scripted one with the TerraGuard 2.2 Security script, and one unscripted to just .. well rezz out and chill with. NOTE to you kiddies at home – please read the instructions for the scripted version if you intend to use it for security on your land. P.S. Please note the Ph34rbot is mod/transfer/no copy permissions, since it must be transfer to deed to group, and mod so you can fix up the authorized avatars notecard for the scripted version. So if you want a back-up for your inv, just grab an extra copy of the hunt gift. This entry was posted in Events, Freebies and Gifts on August 4, 2011 by moriko. 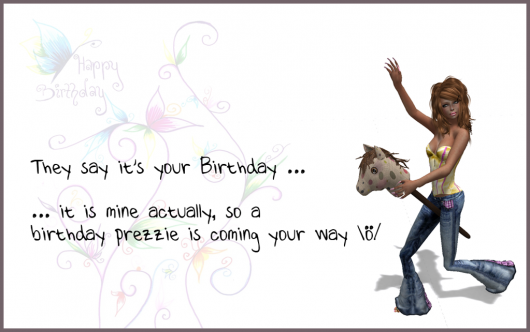 I am having an awesome, sunny, sparkly-bright day, celebrating my birthday and wanted to share it with you guys. So I am sending a prezzie out to in-world, Flickr and Plurk friends as well as my group and subscribo groups. Also available for the next few days in the garden at the -Hanaya- main store. Named after the real me, the Mia Circlet & Earrings set is the sort of thing I used to love to wear to dress up when I played princesses with my mom when I was little. We lost my mom just two months ago, but I know that she would love the idea of this gift, since she was an awesome gardener and had a house full of hibiscus and orchids. This entry was posted in Freebies and Gifts, News on August 2, 2011 by moriko. I was feeling goofy yesterday, so this month’s subscribo gift is goofy too. Picture an innocent looking fish bowl with a cute sculpted tropical fishie that wags its tail as it swims around and around, creating ripples on the water surface. If you missed the delivery, or are not on our mailing list yet, please come by the -Hanaya- main store Customer Info area and grab it from the subscribo kiosk History. This entry was posted in Freebies and Gifts on August 1, 2011 by moriko.